Alleghany County 4-H is hosting it’s 1st Annual Pumpkin Carving Contest. There will be 4 age divisions: Cloverbud (ages 5-8); Junior (ages 9-12); Senior (Ages 13-18) and Adult. The cost to enter is $5 per entry and there will be cash prizes awarded. All pre-carved entries must be dropped off at the N.C. Cooperative Extension of Alleghany County office no later than 5 p.m. on Thursday, September 13. Print an entry form. 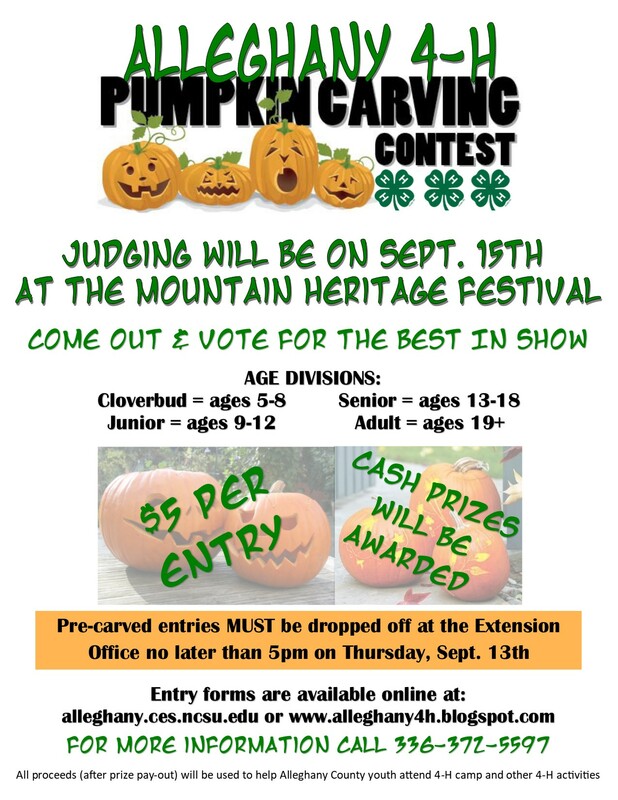 All entries will be displayed at the Mountain Heritage Festival on September 15 at the 4-H booth. Judging for the honor of “Best in Show” will be from 10 a.m. – 4 p.m., so make sure to come by and see us.